With the exception of refrigeration, the technologies that captivate me in the kitchen have been around since the beginning of time. Fire and water are pretty much all I need. But there’s no stopping progress. My brother-in-law recently wrote about how his new oven is connected to the Internet so I know that the smart kitchen is already here. But as my brother-in-law's post makes clear, the smart kitchen has yet to be perfected. According to my friend Ryan H. Behroozi, a Brooklyn-based product designer, the problem with the connected kitchen isn’t in the software, it’s in the hardware. But he’s not suggesting getting a new tablet or touch-screen. He has a better solution, his new HieBAR Kitchen Media Platform, a premium piece of kitchen hardware designed to give safe, ergonomic viewing and fluid access to your tablets and cookbooks. The HieBAR Kitchen Media Platform is debuting at the Bklyn Designs show open May 6-8 in Greenpoint, Brooklyn, and you can also find out more about the HieBAR on its Facebook page. I don’t believe that one needs fancy cookware to make a fine meal. It’s more important to knows one’s cookware, to know one’s stove, to know one’s ingredients, and, of course, to paraphrase the Greeks, to know one’s self. All the same, it's nice to have good pots and pans. I cherish the Le Creuset Dutch Oven that Santa Maria and I received as a wedding present many years ago. And now I can count among my treasures a brand-new Hammer Stahl sauté pan. The manufacturer recently gave me one to test out and write about and it is a fine addition to my kitchen. The bottom is thick and heats evenly. It has a pair of handles, which I found useful while making bacon. And it’s deep, holding four quarts, and comes with a lid, which means it can do double duty making sauces. I used it the other night to prepare my “trusty” puttanesca. I put trusty in quotes, because in recent months the sauce has fallen out of favor with my youngest one. However, the night I used the Hammer Stahl, she ate it enthusiastically. Could it have been the new pan? Who is to say? Through the end of the year, Hammer Stahl is making it easy for you to find out for yourself. It is offering the new, 4-quart deep pan with cover at the special price of $99.00 (regularly $229). Visit www.hammerstahl.com/316Ti to take advantage of this offer. And if you don’t know how to make a puttanesca, get thee to the stove and get started! Heat some olive oil in a heavy-bottomed pan. Add the garlic and anchovies and chili pepper. Saute until garlic is soft, add tomatoes and reduce. When the sauce thickens (in about fifteen minutes), add capers and olives and any herbs. What's the One Thing to Do to Get Better at Cooking for Kids? If you want to get better at cooking for kids, you don’t need to pick up another book. You don’t need to scroll through another blog. You definitely don’t need to take any classes. To get better at cooking for kids, you only need to do one thing: listen to them. Yes, listen to them. I’m not really talking about infants and toddlers, but rather about slightly older kids. If you give them a chance, they will tell you what they want. Heck, even if you don’t give them a chance you’ll hear all about what they want. I’m not saying you have to give them everything they want, but if you listen to them you might just be surprised at the results. As anyone who has ever been married knows, listening does not necessarily come naturally. Sometimes, it has to be learned. I can’t claim to be an expert at listening, but I am an expert at studying how to do it. I’ve discovered it’s a three-step process. The first and the last steps are to stop talking. This also happens to be the second step. While you’re at it, if you’re going to stop talking, you might as well stop blaming, too. And judging. And minimizing. And otherwise invalidating the child’s experience. Listening is key to acceptance. And acceptance is key to everything. I don’t have the vocabulary, experience, or expertise to explain this, and I don’t expect you to take my word for it. Instead, read a bit about the life experience of Marsha M. Linehan, the creator of Dialectical Behavior Therapy. She started out as a disturbed child intent on harming herself and who found freedom and salvation through self-acceptance. For some practical advice, check out this piece on Psychology Today’s website by Dr. Karyn Hall. It’s not an exaggeration to say that everyday I learn the lesson of how important it is to listen. Just the other day I made Puttanesca sauce for Nina and Pinta. The elder one had been longing for it for a while, and I was pleased to break out of a recent cooking drought (have you noticed a lack of posts???) by stirring up the old favorite. But that dinner didn’t go quite as planned. I had chopped the tomatoes and both of my children were put off by the chunkiness of the sauce. They didn’t want to eat it, and I heard them. I often make the pasta and sauce as a side for frozen Alaskan salmon (which is so good it needs no recipe), and it mattered little to me if they ate the pasta with a sauce or plain. Last night, I made the sauce again, but this time around I hit the canned tomatoes with my Braun immersion blender, and the sauce was as smooth as the night was fun. From the second when Nina came home from school and smelled that familiar aroma in the air and wondered what it was, to the moment that Pinta shouted out “Puttanesca,” from her piano bench where she was practicing, it was a peaceful and joyful evening. Listening, it turns out, is good for everyone. Heat some olive oil in a heavy-bottomed pan. Add the garlic and anchovies and chili pepper (or red pepper flakes). Sauté until the garlic is soft, then add the tomatoes and reduce. During my weekly shop on Saturday, the check-out worker at my local coop picked up the massive bouquet of basil that I was buying, and offered me a tip. “You can put the bunch in water, roots and all, and it will keep for days,” he said. Intrigued, I went home and tried it out. First, I checked the Internet to see if he was right. According to this post on The Kitchn the method had promise. It details how to do it, and its comments section will have you believing it works. Only, it didn’t work for me. I stuck the bunch in a pitcher of water, and it started wilting before I could put away half the groceries and have lunch. The leaves weren’t far gone, so I washed them and made pesto. I wondered what I might have done wrong. I didn’t take off the tight rubber band the bottom of the bunch, and maybe that constricted the stems. A closer reading of The Kitchn's article revealed that I should have cut the stems, like fresh flowers. I saved two pieces and ran an experiment. One I cut like flowers, the other I left with the roots intact. I put the two pieces in a clean Mason jar with fresh water, and I waited. A day later, the one with the cut stem is kaput, but the one with the roots is holding on well enough. When I showed it to the kids, Nina said she could smell the basil from across the table. I think I'll try it again sometime with a full bunch. There’s something appealing about having a bunch of basil on the counter, fresh and ready to go, perfuming the air. How do you store your basil? Have you ever tried a method like this? There’s a saying that I can’t help thinking these days: “Life is what happens when you’re busy making other plans.” Often attributed to John Lennon—it is in the lyrics to his song “Beautiful Boy (Darling Boy)—the phrase is actually much older. According to the site The Quote Investigator, it dates back to Allen Saunders, a cartoonist from the middle of the last century. As I’m partial to cartoonists and drawing, that makes me happy. I mention this because as I look around me, and as I go from planning each week’s meals and shopping, and cooking, I realize that life is rushing by. I have things I want to get done—from going swimming and biking with my girls to updating the look and functionality of this blog to publishing another book—that I just can’t seem to get around to doing. That said, there are a few accomplishments I’m proud of. The smallest of these came to me on Friday, when I came across a video on the web that solved a vexing problem—how to cut up a chicken. I’m very good with a knife, because I grew up working in a retail fish market, and I know how to fillet and bone all kinds of fish. I struggle a bit when it comes to poultry and meat, but I’m always confident that I’ll know where to cut and how. But cutting up a whole chicken has stumped me. I can get about three-quarters of the way through the bird, but taking out the backbone was always a problem. I couldn’t figure out where to cut the bird, no matter how many books I consulted. I love cutting up whole birds because it’s a way to save money. When it came to dealing with that backbone, all I did was rip and tear and pull until I had it off. Then I saw this video from Ian Knauer and Gourmet, and on Saturday night I used what learned to cut up a whole bird to make my Chicken, Tomato, Lemon, Potato, and Olive dish. Basically, all you need to do is follow the lines of fat and that will tell you exactly where to cut. The video has all the details. I found the video through Twitter, by following You Fed a Baby Chili? which led me to Cook Fearless, and as soon as I get the chance, I’m going to update my blog roll to include those sites. They are really great. Here’s the how-to video on cutting up a chicken, via Cook Fearless. Enjoy! How Many Burners Does a Man Need? This weekend I realized why people have those fancy six-burner stoves—to impress their neighbors. But seriously, folks, this Sunday morning was the first time I can remember that I did so much cooking at the same time that I ran out of burners. Other people go to church--I go into the kitchen. My four-unit Jenn-Air just wasn’t enough. I had a tagine going, a Bolognese simmering, and a pot of black beans humming along, and I wanted to start my lentil-bulgur soup. That dish needs two burners to get going—one for the lentils proper and one for the base of the soup, and I was one burner short. What did I do? I took the black beans off the heat and let them sit, and went on to make the soup. That was an easy decision, because most of the cooking that’s taking place with those black beans is really just driving water into the center of each bean (I never soak the beans first) and if the pot just sits there, the same thing keeps happening, only more slowly. Problem solved. That little problem was nothing compared to what happened the day before. On Saturday—a day for me that involved getting up at 5:45 a.m. to take care of the weekly food shop, then doing some business in Manhattan in the morning before coming home to take the kids to swimming lessons in local high school, whose pool is in a heated basement that I swear must have been an inspiration for Dante. No, my real problem started when I set out to make a simple dinner of coriander-and-cumin crusted pork chops, green beans, and my signature Thanksgiving (give thanks to Sam Sifton) corn bread. It was the cornbread that gave me conniptions. Now, the thing about this cornbread is that is super easy, and super delicious—provided you get a few basic things right, such as the leavening. One time, in Pennsylvania with my inlaws, I completely forgot to put in the leavening, and the bread came out flat and heavy. It was like Southern matzo—yuch, as they might say. Another time, Santa Maria made the cornbread, and she did it in a rush and she substituted baking soda for baking powder. It looked right that time, but tasted very strange—double yuck, as it were as baking soda is much stronger, and much more alkaline than baking powder. It had a bitter aftertaste that had us scratching our heads, until Santa Maria realized the error of her ways. You’ll find various ratios on-line, but the one that worked best for us is mixing half baking soda and half cream of tartar. For example, if you need to make one Tablespoon of baking powder, mix 1 ½ teaspoons baking soda with 1 ½ teaspoons cream of tartar. And now that I’ve had a chance to calm down, and consult a few other resources, I’ve since learned that baking powder is basically baking soda (an alkali) combined with an acid (typically cream of tartar), with a stabilizer and a moisture-absorber, such as cornstarch. I also learned that many people combine the baking soda with the cream of tartar at a 1-to-2 ratio, and not a 1-to-1 ratio. At this moment, I can’t find a reputable source online to tell you what is correct, but I promise to look. Just know this—the way we did it Saturday worked out just fine. So, more on the baking powder/baking soda substitution shortly, along with details on where cream of tartar actually comes from. I was surprised to learn. Do you know? I get many nice notes in my inbox related to this blog. A recent message from a reader, Michele Hays, who commented on my post about the trouble I had getting my kids to eat my roasted red peppers, alerted me to a potentially helpful resource, It’s Not About Nutrition: The Art and Science of Teaching Kids to Eat Right. The blog is run by a sociologist named Dr. Dina R. Rose, and I know I’ll be spending some time reading it. And the other day, I received a fun invitation from the folks behind The Motherhood. They’re putting on a virtual cooking class on Feb. 2 at 1 p.m. called “Game Day and Slow Cooker Recipes,” and they asked me to co-host it. I hope you can join me. We’ll be asking and answering questions about getting ready for the big game by firing up the slow cooker. I’m a great believer in getting the cooking done before kick off (as I did by making Frikadeller when the Giants triumphed over the Packers a few weeks ago) and the slow cooker is a great, hands-off tool for feeding a lot of folks. My father-in-law has a slow cooker, and I’ve used it a couple of times. What tips do you have for using a slow cooker? And if you have any questions, send them my way, or jump into the class on Feb. 2 at 1 p.m. 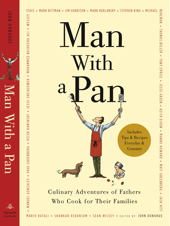 I received an early Christmas gift yesterday: I was shown the cover for my forthcoming book, "Man with a Pan." The artwork is not 100% finished, so I can’t reveal it here, yet, but I’m delighted with it. It put me in the mood to think about giving, and getting. On the giving side, there’s a reading of food-related poetry and prose at The Old Stone House, in Brooklyn, tonight, that benefits the food pantry at St. Augustine’s Roman Catholic Church, in Park Slope. The writers are Greg Fuchs, Jim Behrle, Louise Crawford, Michele Madigan Somerville, Peter Catapano, Sophia Romero, Amy Gilbert and Jake Siegel, and there’ll be snacks, too. On the receiving side, Michael Ruhlman has come up with an inventive set of cooking tools that solve some kitchen problems that only a hyper-busy home cook might have. My favorite of his are the All-Strain Kitchen Cloths, which are pictured below (photo thanks to Donna Turner Ruhlman). I can’t say I’ve had as much trouble has with straining my chicken stock as Ruhlman has (he reverted to using his handkerchiefs), but I’ve always struggled with the task. I use a colander lined with cheesecloth, and it never really works. The cloth never stays in place and part of it often appears to dissolve as I pour the hot stock through it. Ruhlman’s invention would seem to solve that problem, and they look good, too. The other creation of his that caught my eye was the Easy-Clean Knife Grabber. Like Ruhlman, I’ve always found magnetic knife holders beautiful and useful. Ever since I became a parent, though, I’ve been committing the sin of keeping my knives in a drawer (both Santa Maria and the babysitter refused to allow the knives on the wall in reach of the young children; for some reason the blades scared them). I hope that we'll be moving to a new apartment soon, though, and this is one thing I’d like to hang on the wall now that the kids are a little older.